What inspires and moves you? What makes you feel most alive? For me, I find inspiration in all of life, in the little details of the salad my daughter and I are tossing, or even in the way the light shines on our book shelves. I find beauty in my faith, in nature, and mostly, dear literature. My favorite fiction being fairy tales and fantasy. Something about these stories, echoes the faith I have that this world is not my real home. There is something waiting that is better and perfect. Now for clarity, I’m referring to older fairy tales, folktales, and the writings of fantasy giants like J.R.R. Tolkien and his buddy, Mr. Lewis. While fantasy, and all the sub-genres, are more readily available these days, and in some ways a bit more accepted as literature, I’m afraid I haven’t found much that I love and find value in, as I have from the classics. There seems to be a key ingredient missing in most modern fantasy, but what that is, I’m not sure I can pinpoint one main thing. I’ve been thinking about another small funny thing about my love of the fantastical. It has mainly been cultivated in my young adult and not-so-young adult years. That’s right. I’ve grown to love fairy tales and fantasy as an adult. What may seem like a waste of time and an odd choice for an adult to be reading, has, in reality, been water to the parched soil of my imagination. Recently, I pulled off the shelf one of my most favorite books on family culture and home education, Bequest of Wings: A Family’s Pleasures With Books by Annis Duff. This book was published in 1944, but I find much of it strangely relevant for my life today. While Duff and I differ in our beliefs, I can pull out so many gems of glorious beauty. Children do not as a rule make this mistake; they are not so rigidly habituated to the distinctions that grown-ups make between what is probable and possible and what is inconceivable and contrary to reason. They still possess the faculty of imagination that makes room for miracles, perhaps because the marvelous novelty of the world and of living has not yet worn off. The trouble with grown-ups is that they take things too seriously. Where children read fairy tales-and they do read them-just for fun, grown-ups often tend to theorize about ethical, social and cultural values until all the juice is squeezed out. I just love that last line. “Until all the juice is squeezed out”, indeed. As an adult, working backward through the mystery of fairy tales and fantasy, I’m finding a world in which I can make sense of life. I can untangle just a small fraction of the ugliness of reality in this world and partake of beauty not of this world. It makes sense to some inner sensibility in me as a part of the wonderful creation of God. It’s the stark, brutal, horrible world with its insane pace, unreasonable standards, and true falsity that seems strange to me. It is not a particularly healthy thing for children to read about killing. Killing is not a healthy business. But it goes on just the same, and I think that reading about the matter-of-fact way that people have of disposing of their adversaries in fairy tales has perhaps helped to “condition” my daughter to withstand the shock of hearing and reading about the impassioned massacre that men indulge in nowadays. Children, after all, are a part of this world, and however little we and they like some aspects of it, it will not help to draw the veil over the unpleasant things. I know that with my own daughter there is no danger of developing a calloused point of view. Accepting a situation that you cannot do anything about for the moment is quite a different thing from absolving yourself of responsibility for the future, and it is possible that the knowledge that men from time immemorial have killed each other may be the basis of a practical method of discovering how to stop it. My impression is that people in fairy tales behave pretty much as people do in real life. Some live by high principles, some are given over to evil ways; some are kindly in disposition, others practice meanness and persecution. Some go adventuring, some stay at home…And in fairy tales each type, with the action that represents it, is brought to life objectively, emphatically and consistently. Fairy tales do not “condone” behavior that is contrary to ethical principle. They simple recognize the fact that it occurs. Let’s read that again, because I love it so much. Fairy tales do not “condone” behavior that is contrary to ethical principle. They simple recognize the fact that it occurs. Duff goes on to talk about how the characters presented in fairy tales often give her daughter something to draw on, saying so-and-so is like a certain character, for good or for evil. This helps us to turn from that which we dislike and see as wrong and turn toward the good, beautiful, and true. Fantasy generally doesn’t tell us wrong from right, but shows us both sides, leaving us to choose, an important part of life. 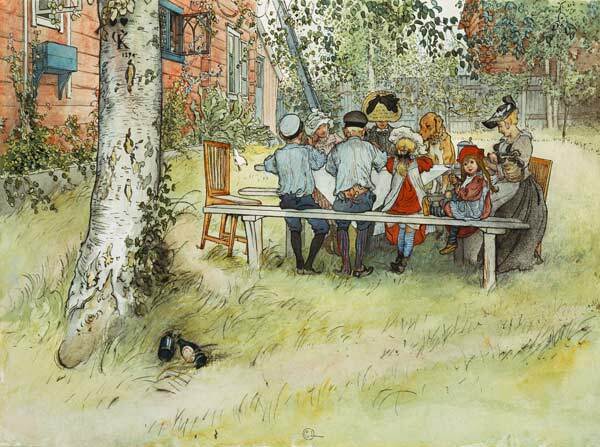 … the great beauty and enduring value of Hans Anderson’s Fairy Tales is that they show life as it is, birth at the beginning and death at the end, and a whimsical mixture of laughter and tears in between. I do not understand why it should be thought right or necessary to shield a child from the knowledge that death is the inevitable, the logical, the adventurous end to living…This idea must grow by slow and comfortable degrees, and I know of few things that show the way more simple and sweetly than Hans Anderson’s stories. He does not twist things away from their natural direction in order to bring about a happy ending, and I think that children feel the dignity and tranquility of his rounded episodes. Tragedy, in Andersen’s tales, is never shocking; he is gentle and patient in teaching children that life does not always have a happy face, and his sense of proportion is so delicate that he never overburdens his readers with sadness. The persuasive feeling of quiet confidence and conviction of the rightness of things as they happen flows steadily through Hans Andersen’s Fairy Tales, and I know it is helping out daughter to form her philosophy of acceptance of the naturalness and inevitability of death and sorrow. Not all fairy tales and fantasy are created equal, as I touched on earlier, especially, unfortunately, the modern genre. However, even in the classics, my children and I have found stories that were too grim for us. Ironically, some of these were from Grimm’s fairy tales. Some of it might find its origins in myth and folktale that is contrary to our faith. Yet, beauty can be found everywhere. I might argue that true beauty is all from the same Source, no matter the conduit that it comes through. We use discernment, but we also don’t live by fear. All of it, everything we partake of, we hold lightly, snapping up the good, and setting aside what doesn’t resonate with us. As Duff says, the ideas in literature “must grow by slow and comfortable degrees”, and I can’t agree more. What are you inspired by? Do you enjoy fairy tales and the fantasy genres in literature?